We bring to you the handmade Wooden Mandir made up of fine quality Sheesham Wood and teak ply wood. There is wooden carved mehraab at the front of wooden mandir with beautiful peacock design. Below that there is main deity’s place where you can place your idols and worship them. At the side of the wooden mandir there is wooden design carved and at the front also there is wooden railings carved. At the wooden mandir bottom area there is wooden sliding drawer placed along with the sliding tray.The wooden mandir bottom area is beautifully carved by our skilled artisans as it gives very elegant and traditional look to the wooden mandir. The wooden mandir is one of the best way to greet your almighty inside your home. As we are the manufacturers so customization are available as per your requirement.We provide free shipping across India. Rosewood is the most famous wood used by the artisans for creating furniture or any type of wooden item especially for home or office purpose. It is the best timber wood which is used in India. Rosewood is comes into different shades like from golden brown to deep brown in color and have dark streaks which give them very attractive look and appearance. Rosewood is famous in India for creating furniture because it does not twist/bend and split. It is the highly durable and is somehow free from dry-wood termite. Some of our Rose wood furniture has wrought iron work which has some iron jaali work and it gives a very elegant look to our Rosewood unit. Rosewood is also used in marine and aircraft grade plywood. Rosewood is perfect for creating antique furniture for homes and for offices as it gives a very smooth finish to the product. Contact us in case you need any other size or design.Kindly Contact us at +91-82668 88634 / +91-81929 99135 for customization. 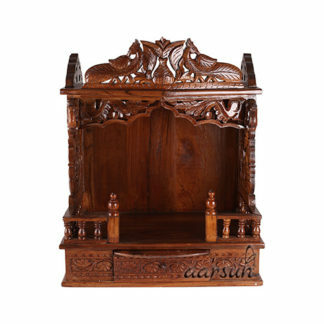 In case you are looking for Teak Wood mandir, Wooden mandir In Teak Wood by Aarsun, also at Handcarved Antique Teak Wood Mandir.